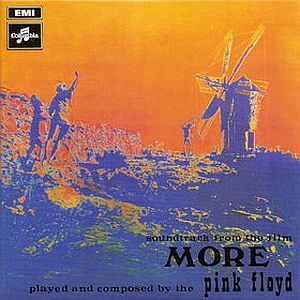 More was Pink Floyd's first venture into scoring music for films, this one by Barbet Schroeder. Like most soundtracks, a good deal of the music was especially designed to back visual elements and thus by themselves are not a very entertaining audio experience without the video. This holds very true for More with songs having titles like Main Theme, Spanish Piece, and Dramatic Theme. However, the soundtrack isn't entirely made of tracks like this. Some of them stand out on their own, including Nile Song (the only noteworthy song that would appear on later compilations) and Cymbaline (my favorite piece on the album). There isn't anything particularly worthwhile to cause one to need this album. Many of the songs are simply ordinary to just plain boring, although this material was quite a departure from Piper at the Gates of Dawn and A Saucerful of Secrets. I'm guessing since this was a soundtrack, many have considered this not to be an "official" studio album, even though the soundtrack was exclusively Pink Floyd. Regardless of how it is classified in the grand scheme of things, it pales in comparison to the rest of the band's catalogue. Recommended for Pink Floyd fans, not worthwhile for anyone else. Two stars.